Global Pet Expo & SuperZoo 2016 – Compared from the attendees’ point of view! Both shows are all about Pets so there are shared features but there are also definite differences. In this report we’ll compare the two shows in terms of exhibitor type and product offerings – the attendees’ view. The history and focus of SuperZoo is the independent pet retailer. It always has been. If you remember the old days in Long Beach, you appreciate the great job that the WPA has done in building this “retailer” show from a regional event to a national “happening”. The influx of attendees from other major retail channels and foreign countries is largely due to the spectacular growth and allure of the U.S. Pet Industry. People from around the U.S. and around the world are interested in what’s happening…right now, in the U.S. Pet Market. Global Pet Expo obviously is the foundation of the entire U.S. Pet Industry and quite frankly, the World of Pet, so it is aptly named. It has only been in recent years that independent pet retailers were invited to attend. The show has also developed such a large international following in attendees and exhibitors because of the spectacular success of the U.S. Pet industry. Everyone wants a “piece of the action” or to emulate the success in their own country…or both! It is the “major leagues” and the show of the U.S. Pet Industry. While both shows are the “best” at what they do, they are evolving and in many ways moving towards one another. With 200,000 outlets in the U.S. and the internet selling pet products, the number of independent pet stores is not growing. SuperZoo sought to broaden their reach by appealing to the fast growing service segments, especially groomers and also welcomed all retail channels to their party. With corporate consolidation a way of life in the U.S., GPE welcomed the independent pet stores into the GPE fold and further enhanced their international mix. This significantly increased the participation at the show, in both attendees and exhibitors. GPE is “the” Pet Party. If you’re anybody in the U.S. Pet Industry or want to be…then you better be in Orlando! Now, let’s take a look at some specific comparisons. The first chart is about exhibitor booth count and special themed floor sections. Both shows have 5 “themes”. You will immediately note the similarities and differences. 3 – Shared; 1 – Similar; 1 – Completely different. 650 exhibitors did both shows. 550 are at SZ, but didn’t do GPE. GPE: 335,000 sq ft; SZ: 245,000 sq ft.
SuperZoo – 200 sq ft (20×10). GPE – 300 sq ft (30×10) GPE booths are 50% larger on average. “Themed” sections have become more popular at both shows, but especially at SuperZoo where, for the first time they represented more than half of the total number of booths. As both shows have gotten so large, the themed sections may help the attendees in “general” product/exhibitor category searches. However, many exhibitors on the open floor have products which would fit into a “themed” section so an attendee shouldn’t limit their efforts to only “themed” sections. Two of the “themes” reflect a major difference in the shows. SZ has a special Groomers Court, which shows their emphasis on this Service segment of the industry. Grooming is also often a major element of a Pet Retailer’s business and SZ is “the” show for retail pet stores. On the other hand, GPE has a special International Section which reflects the “Global” appeal of this show. However, this doesn’t tell the whole story as 20+% of GPE exhibitors are from outside the U.S.
Now, let’s compare the shows by exhibitor “type”, including the type of products by animal. Four times as many Business service exhibitors – 125 vs 30. Although it should be noted that some of these exhibitors’ efforts are also directed towards manufacturers. While the gift and business service exhibitor products have a pet “theme” or are designed to help a pet business, they are “human” products and not designed to help in the care of our companion animals. The large number of these type exhibitors at SZ contributes to a lower percentage of exhibitors with actual “pet” products. Dogs and Cats are the “royalty” at both shows, but as always, Dogs “rule”. The exhibitor count at both shows is remarkably close. The big difference comes in the “specialty” animals – Fish, Birds, Reptiles, Small Animals and Horses. Except for Equine, GPE has 30 to 60% more exhibitors with products focused on these pets. This seems a bit surprising as pet retailers are a major consumer source of both products and live animals for these “specialty” pets…and SZ’s focus is Pet Retailers. Next we’ll look closer at Dog and Cat. The top 10 product categories in terms of number of exhibitors are the same for both shows. There are just a couple of differences in rankings. 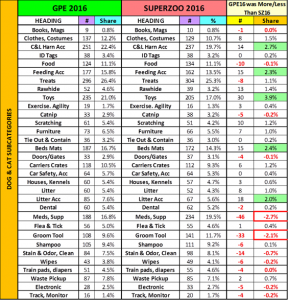 SuperZoo has 46 more exhibitors offering Meds/Supplements, moving it into the #3 spot and challenging Collars & Leads for #2. This is not totally surprising as there is an incredible surge in this category, with new vendors arriving almost daily. I’m sure that GPE will reflect this trend by show time in 2017. With SuperZoo’s commitment to the Groomer’s segment, the higher ranking of Grooming Tools is to be expected. Clothes, Costumes ranking higher at GPE is a bit of a surprise with SZ’s long time commitment and the popularity of “Rodeo Drive”. However, when you look closer, the difference is only 8 exhibitors. The strength of this category at both shows is a reflection of one aspect of the “humanization” of our companion animals. 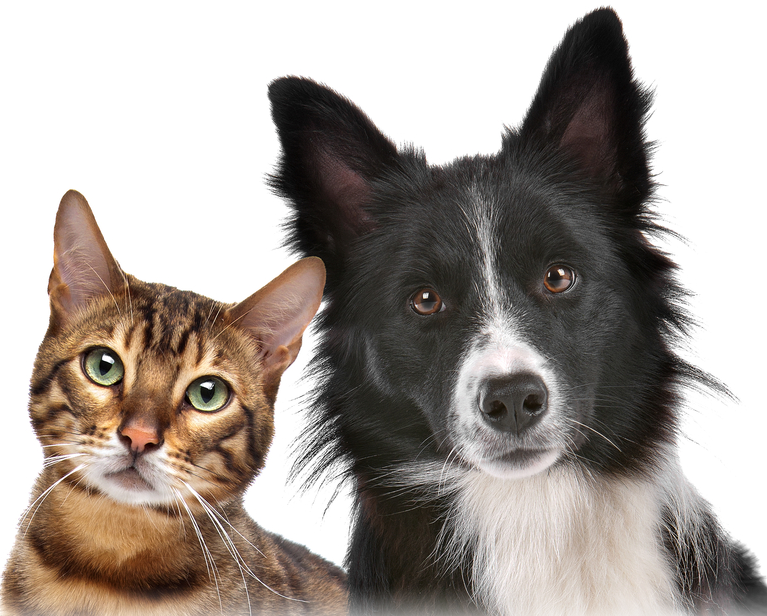 Dog and Cats are the royalty of the Pet Industry. Although the shows have a slightly different focus, the top 10 categories are the same. To be successful the shows still must ultimately reflect the needs of the true industry “drivers” – the consumers. Next is a chart comparing the 2 shows in 32 Dog & Cat Product Categories. Categories with more than a 2% difference in share of booths are highlighted. Both shows have an overwhelming commitment to dog and cat products – as they should. The category numbers for both shows are generally very close. 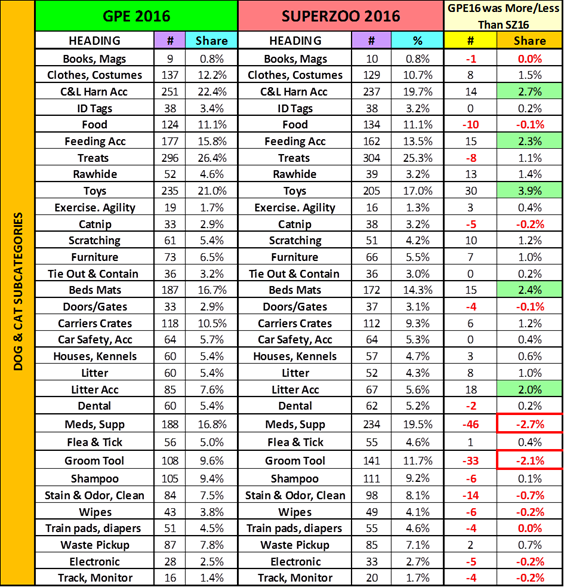 The biggest differences, in Meds/Supplements and Grooming Tools, showed up in our discussion of the “Top 10” and reflect a current “red hot” trend, which is growing daily as well as the emphasis on Groomers at SuperZoo. Although there is a “core” group of attendees at both shows, the shows do have a slightly different focus, which they clearly state – upfront. SuperZoo is “The National Show for Pet Retailers” and GPE is “Global” Pet Expo. This affects both the type of exhibitors and the audience that attends. Because Pet Retailers are the largest share of their audience, SZ booths have a higher number of distributors as well as exhibitors with business services, gift products, or items relating to grooming services. Global Pet Expo – the name says it all. Exhibitors and attendees flock to Orlando from around the world. Both shows are filled with people trying to get a bigger share of the consumers’ Pet Spending $. Over 650 “key” pet companies do both shows. This means that every pet product category is extremely well represented in Las Vegas and Orlando. However, new products, new companies and new ideas happen almost every day in the Pet Industry. Over 1000 of the total exhibitors only did one of the shows! This is why, despite their differences, both shows draw attendees from every retail channel and from around the world. Global Pet Expo is only 7 months away. See you in Orlando!